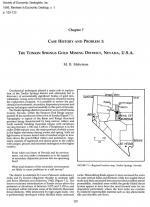 Case history and problem 1: the Tonkin Springs gold mining district, Nevada, U.S.A.
Издание: Economic geology, 1986 г., 5 стр. Geochemical techniques played a major role in exploration of the Tonkin Springs district and ultimately led to discovery of economically significant bodies of gold mineralization. Using some of the information obtained during the exploration program, it is possible to review the geochemical environment, secondary dispersion processes and survey techniques used successfully in this part of Nevada. The Tonkin Springs district is located in west-central Eureka County, Nevada, within the Simpson Park Range approximately 65 km northwest of the town of Eureka (Figure 7.1). Topography is typical of the Basin and Range structural province being characterized by long narrow valleys and north easterly trending mountain ranges with elevations varying between 1,700 and 3,100 m. Precipitation is in the order of 400 mm per year, the major portion of which occurs in the higher elevations during winter and spring. Soils are light brown to brown desert soils of residual origin in locations above the gravel-filled valleys and pediments. Vegetation consists of sagebrush and sparse grass in the valleys with juniper, pinyon and mountain mahogany in the higher country. Издание: Геологический комитет, Петроград, 1916 г., 68 стр. Келловейские и оксфордские отложения московской юры по большей части бедны хорошо сохраненными аммонитами. 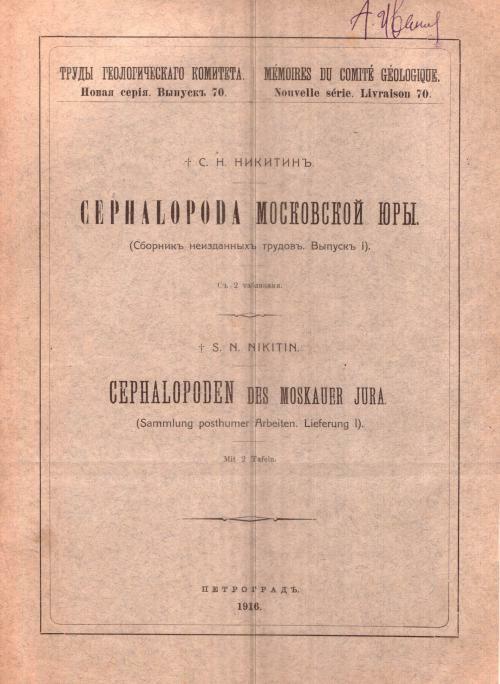 Остатки их, конечно, попадаются нередко, но это или обломки, или молодые, или внутренние обороты взрослых экземпляров, превращенные в колчеданистые ядра. Отсюда только обстоятельное знакомство с прекрасным палеонтологическим материалом из других окружающих местностей России, где развиты юрские образования, позволило мне определить многие формы аммонитов из подмосковного келловея и оксфорда. Только с тем огромным и разнообразным материалом, который был в моем распоряжении, можно было сравнить и сопоставить эти формы с западно-европейскими с достаточною степенью точности и избежать того смешения в московской юре форм различных этажей и зон, которое допускалось в прежних работах моих предшественников по исследованию. 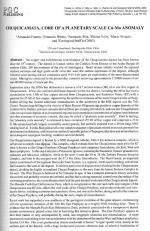 Издание: Economic geology, 2004 г., 22 стр. The Jerónimo sedimentary rock-hosted disseminated Au deposit is located within the Potrerillos district of the Atacama region of northern Chile, east of the Potrerillos porphyry Cu-Mo and El Hueso high-sulfidation Au deposits. Prior to development, the Jerónimo deposit contained a resource of approximately 16.5 million metric tons (Mt) at 6.0 g/t Au. Production began in the oxidized, nonrefractory portion of the deposit in 1997 and terminated in 2002. During that time, approximately 1.5 Mt at 6.8 g/t Au was mined by underground room-and-pillar methods, from which a total of approximately 220,000 oz of Au was recovered by heap-leach cyanidation. 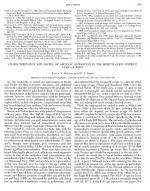 Издание: Economic geology, 1988 г., 9 стр. The geology of northwestern Mexico is complex and is similar in many respects to that of southeastern California and southern Arizona. The region (Fig. 1), typical of the southern basin-and-range physiographic province of which it is a part, is characterized by elongate, northwest-trending ranges separated by wide alluvial valleys. Basement rocks in the area include Precambrian gneisses, metamorphosed andes-ites, and granites. These rocks are overlain by younger Proterozoic quartzites and limestones, Paleozoic and Mesozoic carbonate rocks, and Mesozoic volcanic, clastic, and carbonate sedimentary rocks. Mesozoic plutonic rocks and Tertiary extrusive and intrusive rocks related to volcanic activity of the Sierra Madre Occidental are widely distributed. Broad areas are underlain by plutonic and associated volcanic rocks of the Sonora-Sinaloabatholith of Cretaceous to early Tertiary (Laramide) age. The outcrop areas of the plutonic rocks are smaller in northwestern Sonora, west of Magdalena de Kino where many of the gold deposits are concentrated, than they are farther to the east and south (Fig. 2). The Mercur gold district of north-central Utah includes several sediment-hosted disseminated gold deposits which are located in the lower member of the Mississippian Great Blue Limestone. Argillic alteration of host limestone consists of illite (R3 illite-smectite <10% S) + kaolinite + quartz ± Fe oxides or pyrite. Argillized limestone has identical clay mineralogy in both oxidized and unoxidized rock. 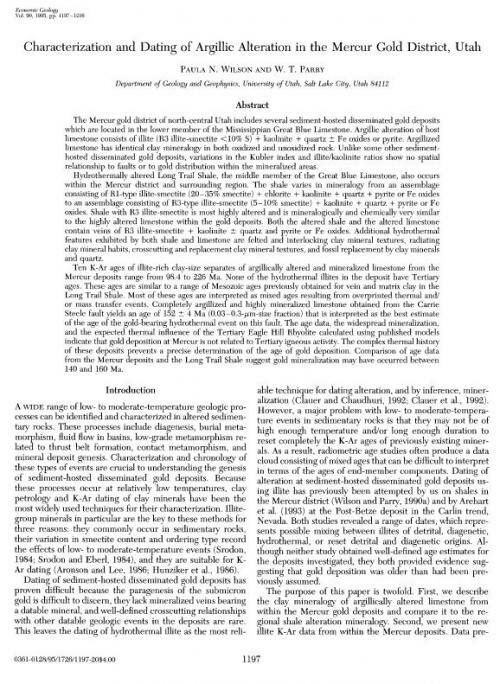 Unlike some other sediment-hosted disseminated gold deposits, variations in the Kubler index and illite/kaolinite ratios show no spatial relationship to faults or to gold distribution within the mineralized areas. 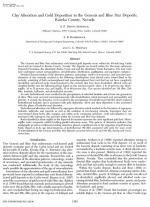 Издание: Economic geology, 1997 г., 2 стр. 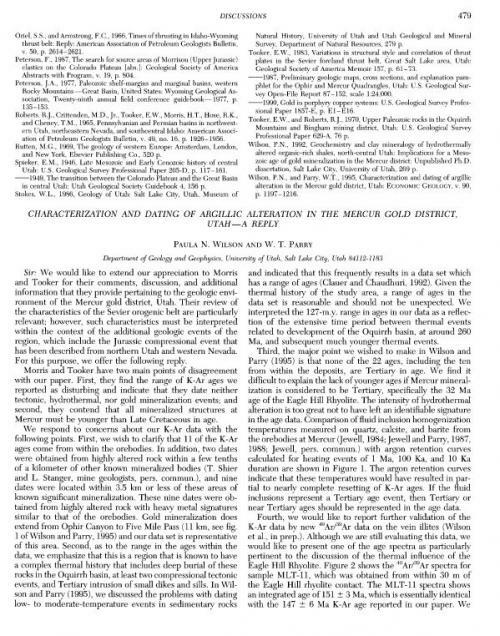 Wilson and Parry (1995) present data pertaining to clay alteration and K-Ar age dates for samples from the Mercur gold district. Their data record a wide spread of K-Ar ages for illite ranging from 98.4 to 226 Ma. 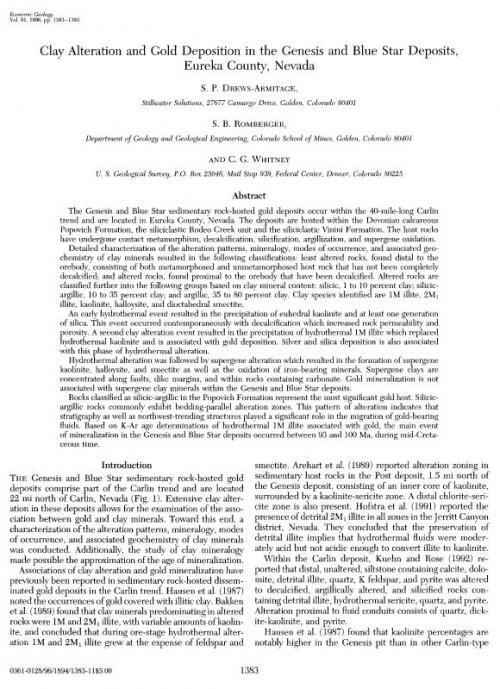 They estimate the age of gold mineralization to be between 140 and 160 Ma and explain the wide range of ages as functions of partial thermal resetting of the clay minerals and the distance from the hydrothermal conduits. 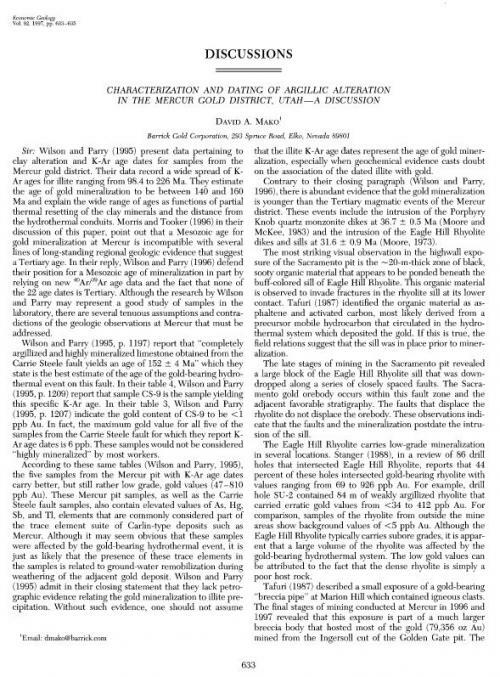 Morris and Tooker (1996) in their discussion of this paper, point out that a Mesozoic age for gold mineralization at Mercur is incompatible with several lines of long-standing regional geologic evidence that suggest a Tertiary age. 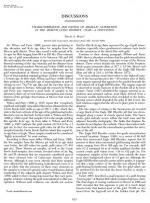 In their reply, Wilson and Parry (1996) defend their position for a Mesozoic age of mineralization in part by relying on new 40Ar/39Ar age data and the fact that none of the 22 age dates is Tertiary. Although the research by Wilson and Parry may represent a good study of samples in the laboratory, there are several tenuous assumptions and contradictions of the geologic observations at Mercur that must be addressed. 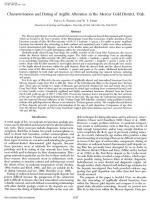 Издание: Economic geology, 1996 г., 3 стр. 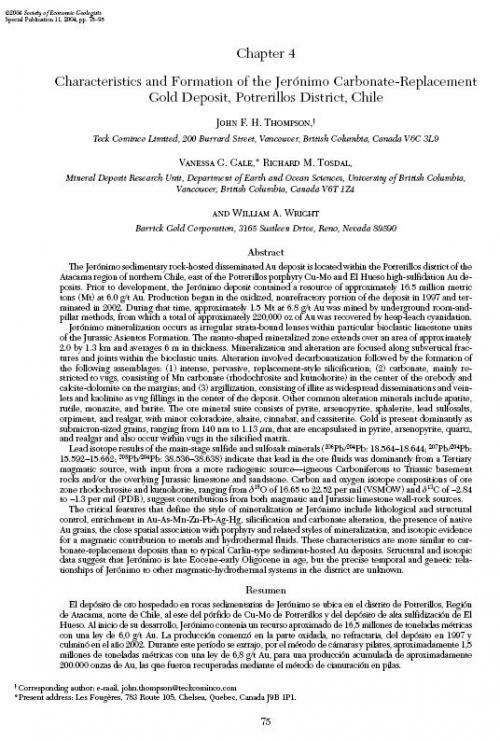 We would like to extend our appreciation to Morris and Tooker for their comments, discussion, and additional information that they provide pertaining to the geologic environment of the Mercur gold district, Utah. 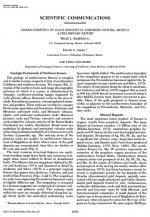 Their review of the characteristics of the Sevier orogenic belt are particularly relevant; however, such characteristics must be interpreted within the context of the additional geologic events of the region, which include the Jurassic compressional event that has been described from northern Utah and western Nevada. For this purpose, we offer the following reply. 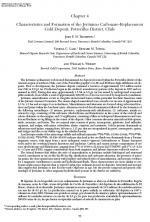 Morris and Tooker have two main points of disagreement with our paper. First, they find the range of K-Ar ages we reported as disturbing and indicate that they date neither tectonic, hydrothermal, nor gold mineralization events; and second, they contend that all mineralized structures at Mercur must be younger than Late Cretaceous in age. 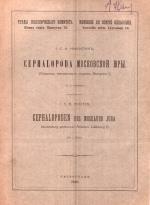 Издание: PGS Publishing, Linden Park, 2002 г., 20 стр. Strata-bound Cu- (Ag) deposits, long known as 'Chilean manto-type', occur along the Coastal Cordillera of northern Chile (22°-30°S) hosted by Jurassic and Lower Cretaceous volcanic and volcano-sedimentary rocks. These deposits are typical of the first stage of Andean evolution characterised by an extensional setting of the arc magmatism along the active margin of South America. Strata-bound Cu- (Ag) deposits were formed during two metallogenic epochs in the Late Jurassic and uppermost Early Cretaceous. The mineralisation took place at the time of structurally controlled emplacement of batholiths within the Mesozoic volcanic and sedimentary strata. The volcanic-hosted strata-bound Cu- (Ag) deposits invariably occur distal, but peripheral to coeval batholiths emplaced within tilted Mesozoic strata. The prevalent view that these deposits have an inherent genetic relationship with hydrothermal fluid derivation from subvolcanic stocks and dykes is contended here, because these minor intrusions are largely barren and this hypothesis does not fit well with Sr, Os and Pb isotopic data that call for crustal contribution of these elements. The strata-bound Cu- (Ag) mineralisation appears to be produced by fluids of mixed origin that were mobilised within penneable levels and structural weakness zones of the Mesozoic arc-related volcano-sedimentary sequence during the emplacement of shallow granodioritic batholiths under transtensional regimes. These hydrothermal fluids deposited copper and subordinate silver when reacted with organic matter, pyrite and/or cooled away from their heat sources. 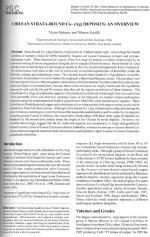 Although strata-bound Cu- (Ag) mineralisation took place during the same Cretaceous metallogenic event that formed the magnetite-apatite bodies, and Fe-oxide-Cu-Au deposits along the present Coastal Cordillera, the conceivable relationships with these other types of deposits are hampered by the inconclusive debate about the origin of the Chilean Fe-oxide deposits. 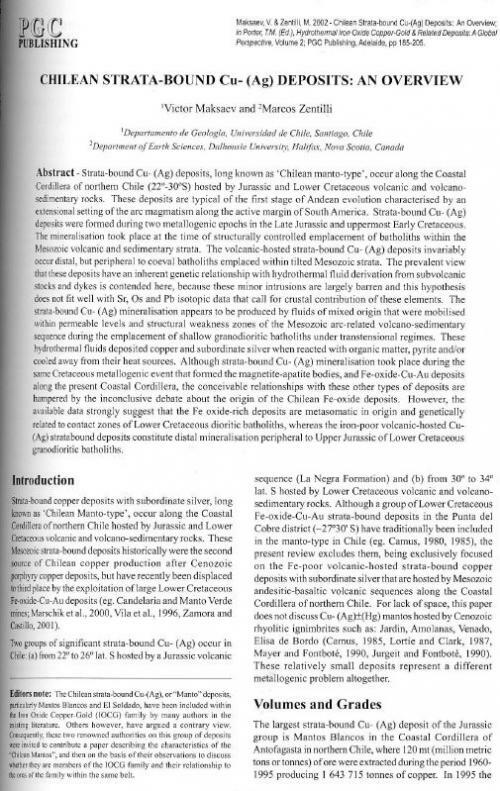 However, the available data strongly suggest that the Fe oxide-rich deposits are metasomatic in origin and genetically related to contact zones of Lower Cretaceous dioritic batholiths, whereas the iron-poor volcanic-hosted Cu-(Ag) stratabound deposits constitute distal mineralisation peripheral to Upper Jurassic of Lower Cretaceous granodioritic batholiths. Издание: PGS Publishing, Linden Park, 2005 г., 24 стр. 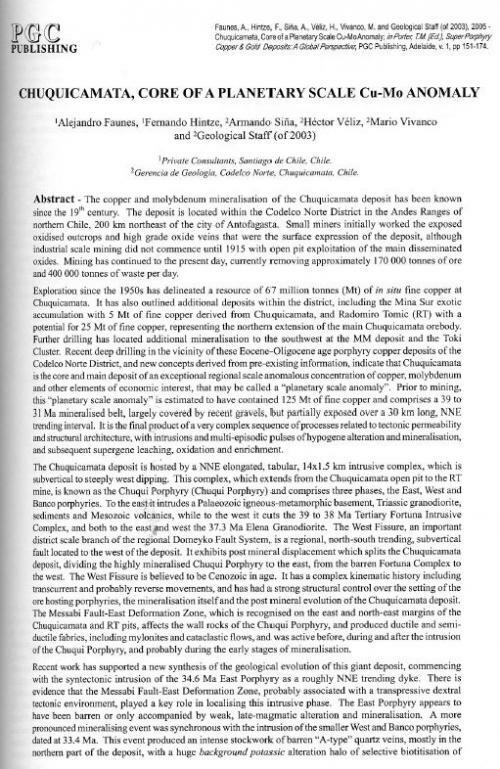 The copper and molybdenum mineralisation of the Chuquicamata deposit has been known since the 19' century. The deposit is located within the Codelco Norte District in the Andes Ranges of northern Chile, 200 km northeast of the city of Antofagasta. Small miners initially worked the exposed oxidised outcrops and high grade oxide veins that were the surface expression of the deposit, although industrial scale mining did not commence until 1915 with open pit exploitation of the main disseminated oxides. Mining has continued to the present day, currently removing approximately 170 000 tonnes of ore and 400 000 tonnes of waste per day. Автор(ы): Drews-Armitage S.P., Romberger S.B., Whitney C.G. Издание: Economic geology, 1996 г., 11 стр. 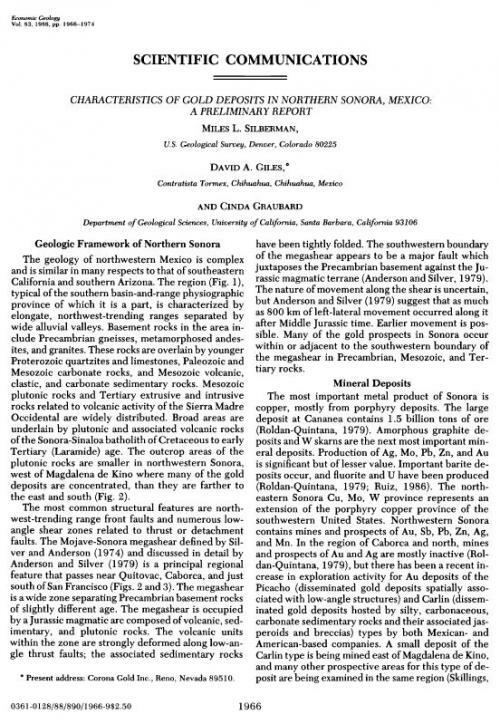 The Genesis and Blue Star sedimentary rock-hosted gold deposits occur within the 40-mile-long Carlin trend and are located in Eureka County, Nevada. The deposits are hosted within the Devonian calcareous Popovich Formation, the siliciclastic Rodeo Creek unit and the siliciclastic Vinini Formation. The host rocks have undergone contact metamorphism, decalcification, silicification, argillization, and supergene oxidation.